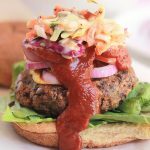 Simply delicious and full of flavor, you have to give this Black Bean Farro Burger a try, and serve it with this super tasty Spicy Slaw. Since becoming a vegetarian let me tell you, I’ve had a few. I remember the first time I ordered one at a restaurant how surprised I was when it was placed in front of me, it was a pre-packaged frozen burger I could have purchased from my grocery. Those burgers are ok and they are tasty, but I wanted a hand-made veggie burger. So my quest was on for an awesome veggie burger. I’ve tried many a recipe and I don’t expect for the burger to taste like meat, I just want a tasty burger that doesn’t require a super long list of ingredients. Let’s be real, when searching for recipes if the recipe has a boat load of ingredients I’m probably going to move on to the next one. My criteria was a recipe that didn’t have a super long ingredient list, ingredients were easy to find or sub if needed and the instructions easy to follow. The idea for this burger came to me while eating my Strawberry Basil Farro Salad. Because farro has a textured bite I thought would be perfect in a veggie burger. Turns out I was right. You just have to be careful not to over-mix or it will turn to mush. These burgers are easily prepared by heating them in a skillet, grill pan or counter top grill. After allowing them to cool slightly, serve on buns with desired toppings. One you might want to add is the Homemade Vegan Barbecue Sauce, I shared last week, you can find the recipe here. 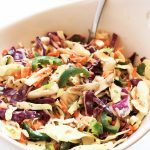 To take this burger up a notch I made this spicy slaw to be served alongside or on top. To make it even easier I started with a pre-sliced bag of slaw and added some carrots, jalapeño, cilantro and chia seeds. Very simple, satisfying, super filling and need I say seriously delicious. 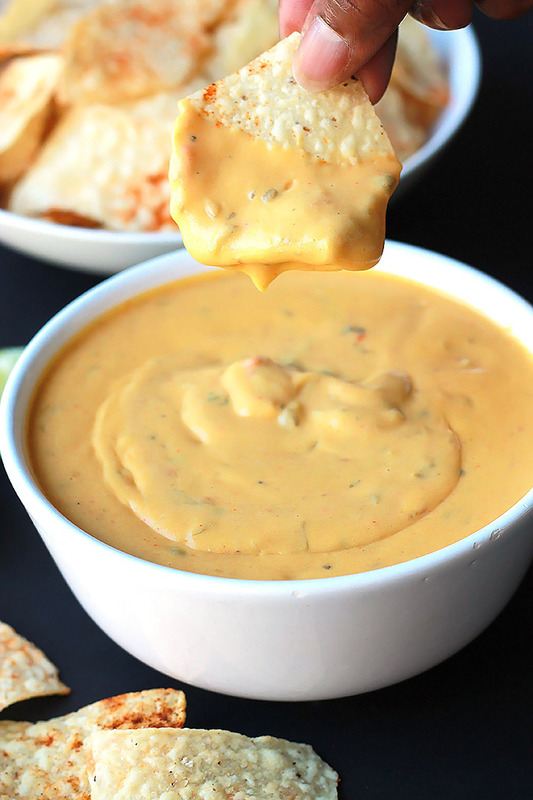 This recipe is a winner! Prepare farro according to packaged directions, when done place in a large bowl, cover and set aside. While farro is cooking, heat olive oil in a skillet over medium heat, when oil is simmering add onions and saute until onions are softened and translucent. Add onions to the bowl with the farro. Open can of black beans, rinse, drain and with clean hands mash them over the bowl with the farro, some of the beans will be unmashed and that’s ok. You do not want to over mash. Add in the liquid smoke, sugar, garlic powder, paprika, steak seasoning, bread crumbs and barbeque sauce. When burgers have cooled slightly, serve on buns with desired toppings. These burgers can easily be frozen for later. After cooking allow to cool, wrap in parchment paper or wrap in plastic wrap. Place wrapped burgers in a freezer zip bag and remove as much air as you can, zip and place in the freezer. 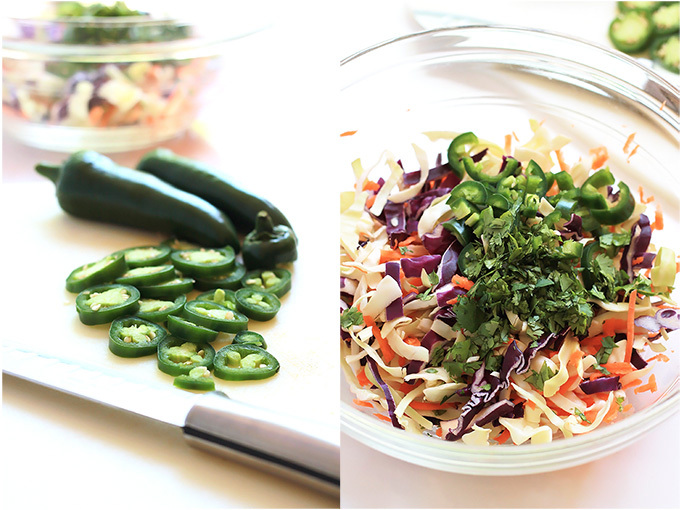 Place all of the spicy slaw in a large bowl. In a smaller bowl combine the dressing ingredients. pour over the slaw and toss to combine. Taste and season with a bit of salt and pepper as needed. If you make this recipe or a version of it, take a picture and share with me on Instagram, tag it #thewholeserving or leave a comment below. 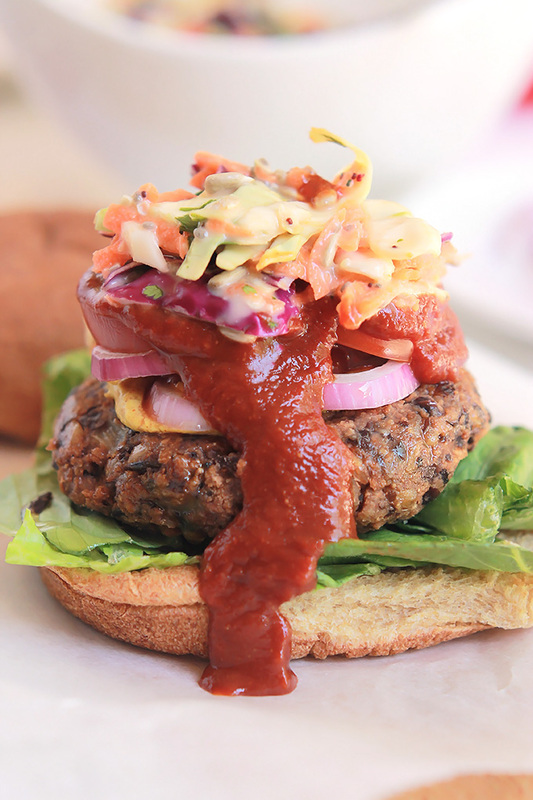 I’d love to see or hear about your version of this Black Bean Farro Burger and Slaw. This looks so good Celeste! My husband and I had our first black bean burger in a restaurant while we were on the Daniel Fast, and it was amazing. This recipe looks like it will be perfect, and I can’t wait to try it! Thank you Aakiee! Maybe sometime during the upcoming warmer months you’ll have a chance to give it a try. OMG this looks soo yummy!!!! They are rather tasty, I sometimes just eat the burger without the bun.So good! Yum! I love the easy recipe and the fact that this actually looks like a burger. This will definitely be one I try for my meat-loving husband. Thanks Celeste! Thanks Dr Becky, I hope he enjoys it! Ooooh….I don’t know what looks better…..the burger or the slaw. Good thing you put the combo together!!!! Thanks….can’t wait for warmer weather and “bbq” feels to try it out. Hopefully you’ll have that warmer weather very soon. Looks yummy! I have black beans and farro in my cupboard now! I love it when I see a recipe I want to try and I have all of the ingredients on hand. It’s a wonderful thing. CelesteI’m going to ask a dumb question but what is farro? Is it a grain? This really looks yummy and I’d like to try some version of it if I can’t find the farro. Your photography is magazine worthy!! 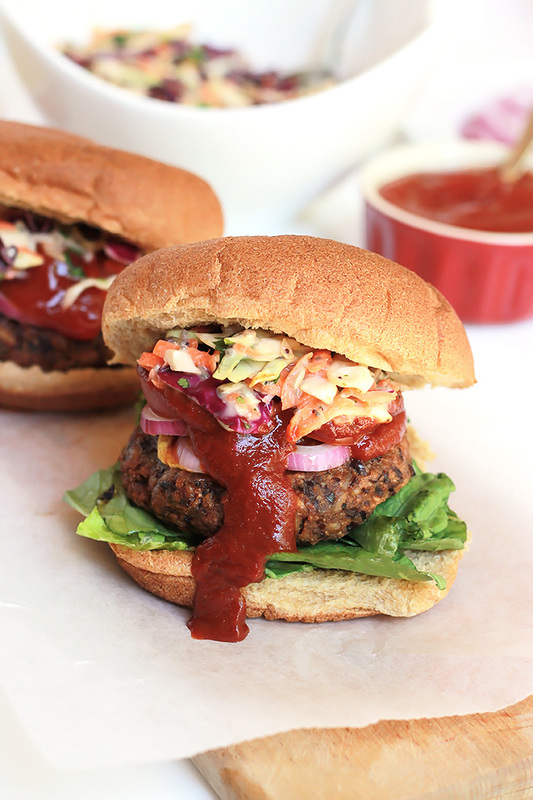 The slaw sounds like an amazing addition to the veggie burger. A little crunch to make it interesting…perfect! Thanks for sharing at the Healthy Living Link Party. You are so right Leigh and it takes it all to the next level. Yum! 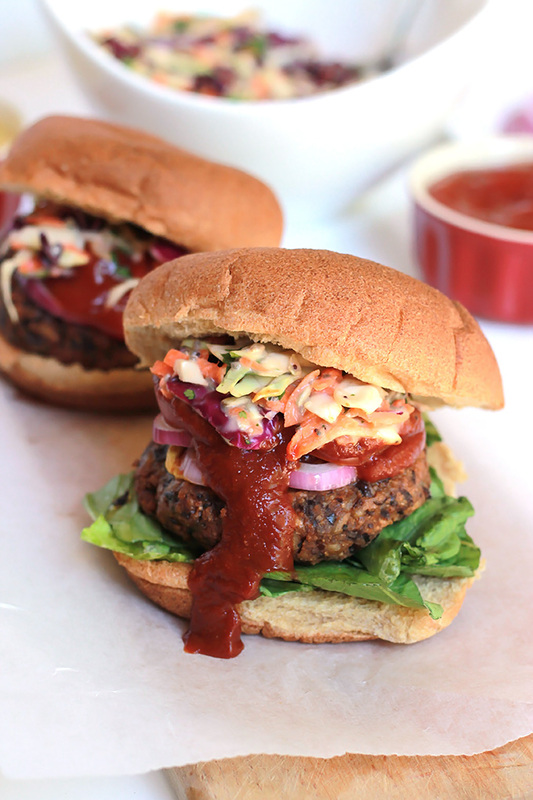 I love black bean burgers and love the spicy slaw recipe. oh my this looks amazing!! Would love to have you share at the What’s for Dinner blog hop! Thanks Helen for letting me know about your party. Ok, I am done for tonight. I just read this as Feral Burgers! Sorry, short comments today. Migraine. Thank you for sharing. Yummed! Sorry to hear you are not feeling well, I know a little something about migraines. Hope you get to feeling better very soon. I love me some veggie burgers! I’m not a vegetarian, but it’s my burger of choice 🙂 And this black bean and farro combo sounds amazing! I love the taste and texture farro brings… and the spicy slaw? Totally my style of topping. Can’t wait to give this a try! Pinned! I hope you get to try soon and enjoy it as much as we do in my house. Thanks Emma, the slaw really makes a difference. oh god that looks so amazing.. Thanks Hena, I hope you enjoy them as much as I do. Celeste, this burger looks absolutely delicious. I like black bean burgers and so does my daughter, who is a vegetarian. This summer we can whip up a round of these so that she can partake in the summer barbecue season too. I think it’s a must to also make the slaw, it looks incredible, and the barbecue sauce. I want to eat it right now off my phone screen. 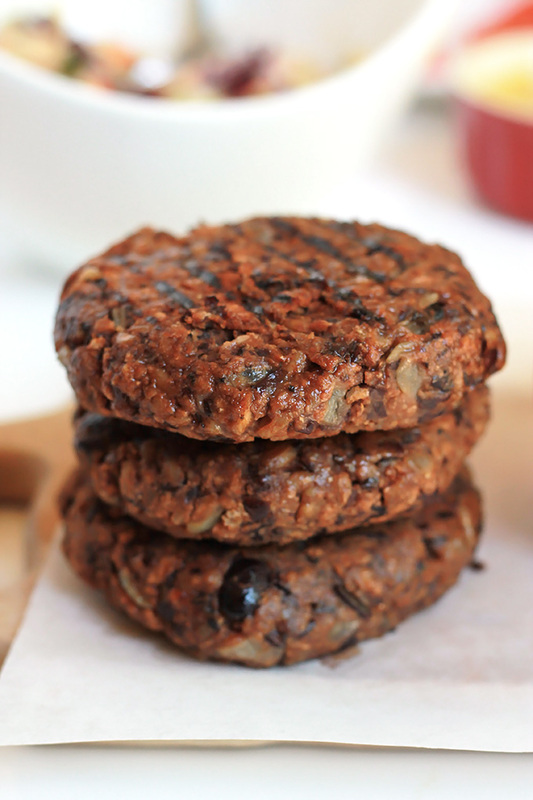 I love black bean burgers and these look amazing! Thanks so much for sharing at Merry Monday this week! And thanks for hosting Merry Monday. I’ve been wanting to try out black bean burgers and this one looks perfect!! Thank you so much for sharing it at Tasty Tuesday where you’ve been featured! Please come back! Thanks Stephanie for featuring my Black Bean Farro Burger. I truly appreciate the feature. These burgers look great, and the coleslaw, even better! Love that jalepeno and cilantro in there! Hi Barrie, I’m glad you like it, please enjoy! This looks delicious!! You’ve really taken bean burgers to the next level 🙂 Thanks so much for sharing on the Healthy Living Link Party! We hope to see you back tonight! Thanks Jennifer, I hope you give it a try. Have a wonderful weekend! Hi Celeste, as usual your photography is beautiful and your recipes delicious. What would you sub for the farro if I wanted to make this gluten free? Hi Lynn, thanks for the compliment, it means a lot. A good sub to make this dish gluten-free would be brown rice, buckwheat, quinoa or sorghum. Please let me know how it works for you. These look and sound so delicious – they are definitely landing on our dinner table soon. Thanks for sharing your recipe with us – pinning to share and refer back to when I make them. I’m so glad that you like it and I hope your family enjoys it as much as mine does. 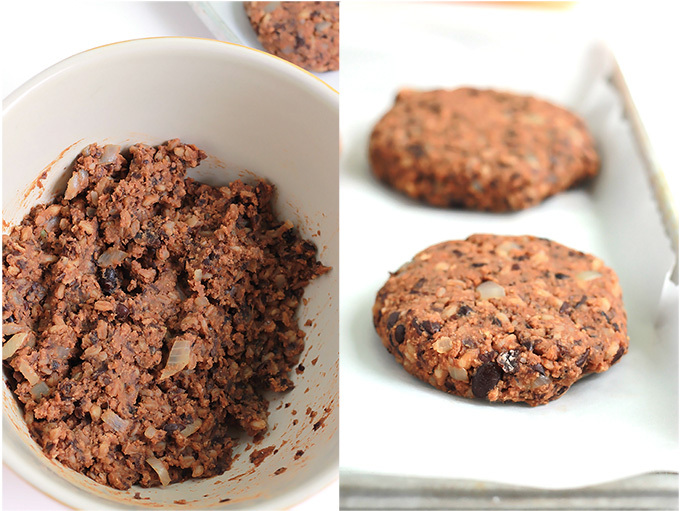 Chelsee thanks for hosting the Best of the Blogosphere Link Party and please enjoy the Black Bean Farro Burger. I can’t believe those are veggie burgers! They look amazing! 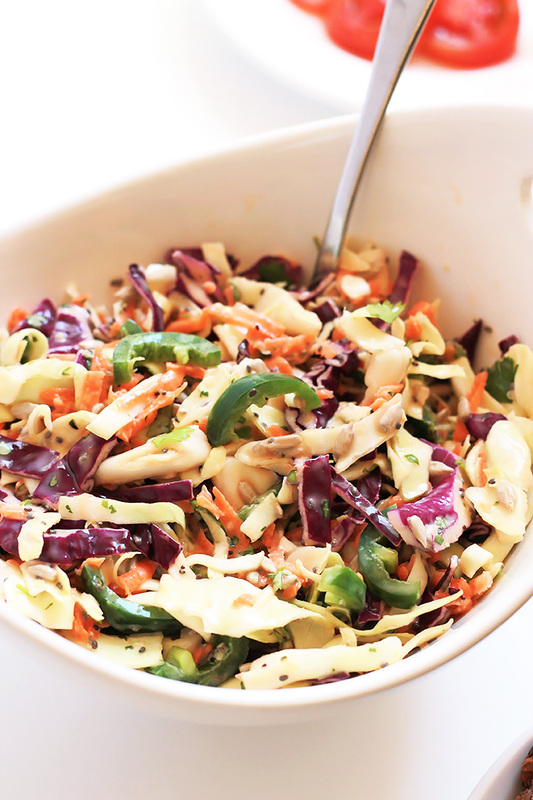 That slaw is beautiful and I can tell from the ingredients it’s going to be yum, I’m pinning! 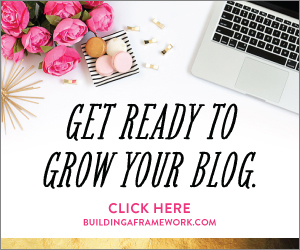 Thanks so much for linking up at You Link It, We Make It. Hope to see you back tomorrow! Thanks April, adding the slaw makes all the difference. Enjoy!!! Thank you Laura for the feature, I really appreciate being featured. I tried to leave you a comment on your blog but for some reason I received an error message. Just an FYI, of course it could be an error on my end. Hope you are having a wonderful week.